Hey, party peeps! Halloween is right around the corner and if you’re still looking for Halloween party ideas for kids or teens, then this is it! 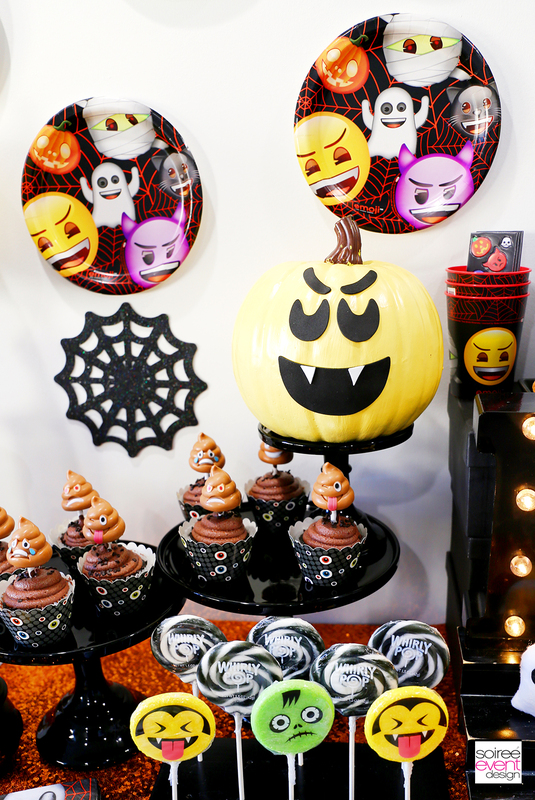 Today I’m sharing with you my EMOJI HALLOWEEN PARTY IDEAS including an Emoji Halloween Trick-or-Treat Table, DIY Emoji Halloween Pumpkins, Poop Emoji Cupcakes and Poop Emoji Milkshakes! EMOJI HALLOWEEN PARTY IDEAS – THE INSPIRATION! 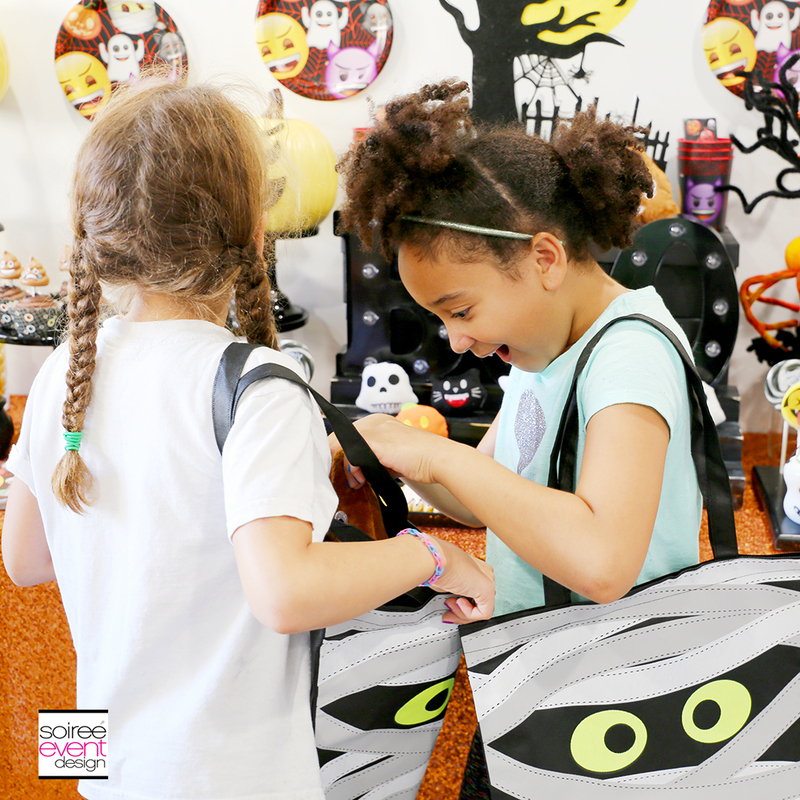 These Emoji Halloween party supplies from Oriental Trading were my inspiration for the whole party design. You can find these and many of the Halloween decorations I used for this over on Oriental Trading. This post was sponsored by Oriental Trading with either payment and/or product to review. All opinions are my own as I ONLY promote brands that I LOVE and actually USE. Do your kids go trick-or-treating with their friends? So do my kids. This Emoji Halloween Party would be a great party to host on Halloween night right before you all go trick-or-treating. Invite their friends over for some Emoji Halloween party fun and enjoy a few sweet treats before heading out for a night of fun. This way you can still have a fun party but not have to spend a fortune on fully stocking a candy table since the kids will be loading up on candy when they go trick-or-treating anyway. 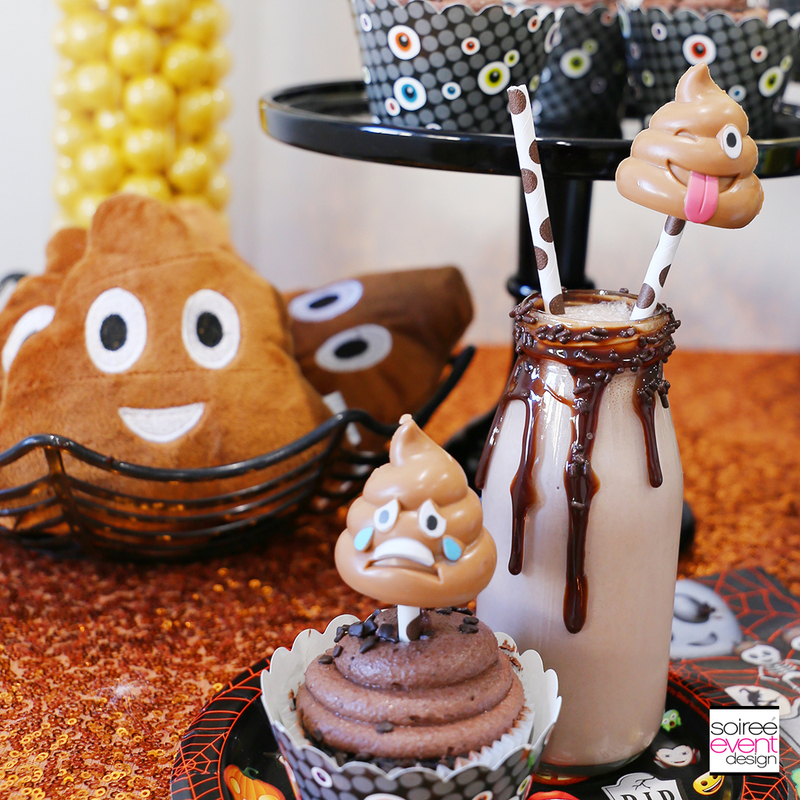 Instead, offer a few sweet treats and party favors like these awesome plush Poop Emojis. Kids love Poop Emojis! Go figure! 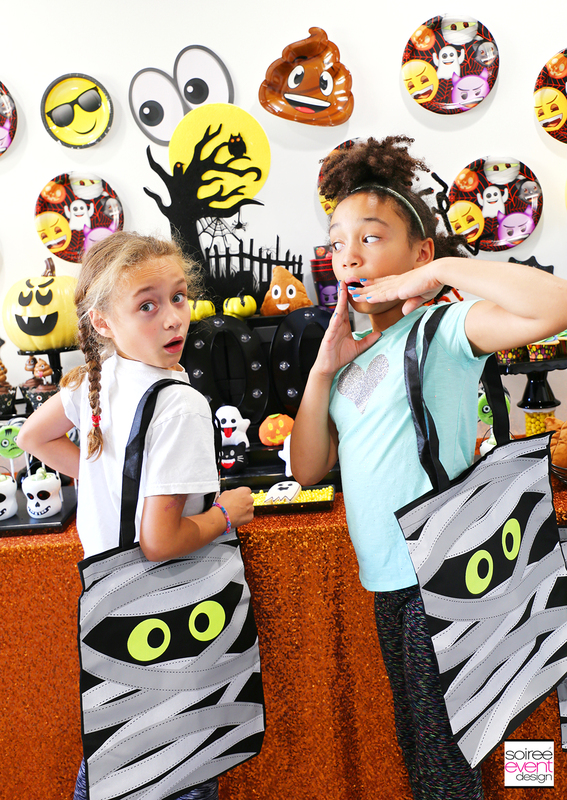 Give each guest one of these huge Mummy Tote Bags too to put their favors and to go trick=-or-treating! EMOJI HALLOWEEN PARTY IDEAS – SET THE SCENE! 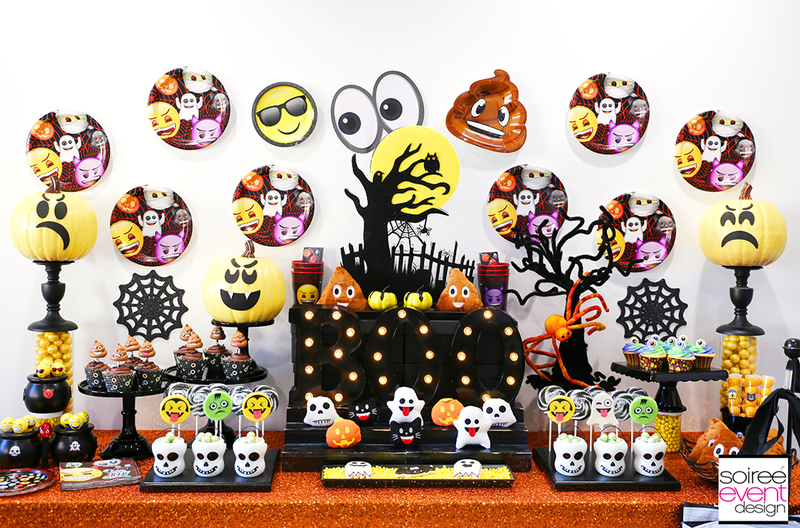 Set up a Emoji Halloween Trick-or-Treat Table at your Emoji Halloween Party for your guests. 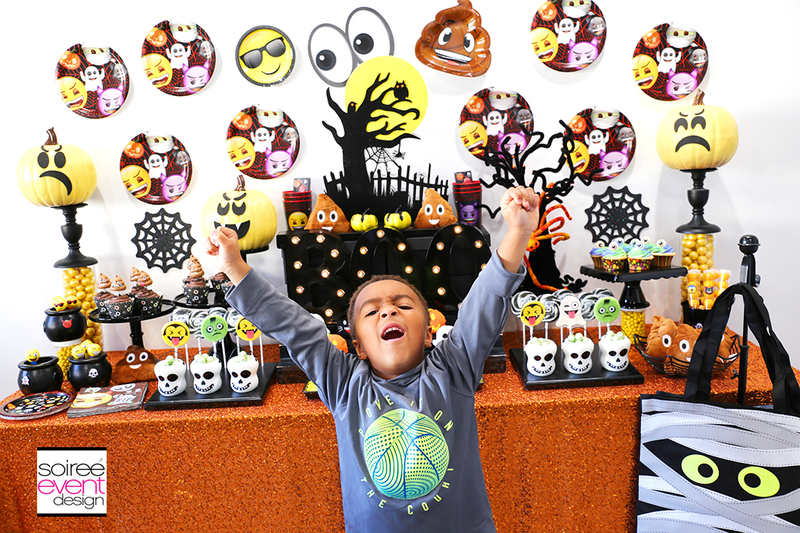 Create this awesome backdrop in minutes by placing the Emoji Halloween Paper Plates on the wall. GIRLFRIEND TIP: Use Frog Tape to secure the plates to the wall. It is THE BEST! It is a staple in my party kit as it doesn’t fall off the wall and removes without damaging your wall. No more being afraid to stick something on your wall! The creative options are endless now! I also added a Poop Emoji Plate and the Eyeball Emoji from a pack of Emoji Photo Props to the wall. They look like they are peeking out behind the Haunted House Centerpiece. Isn’t that cute? 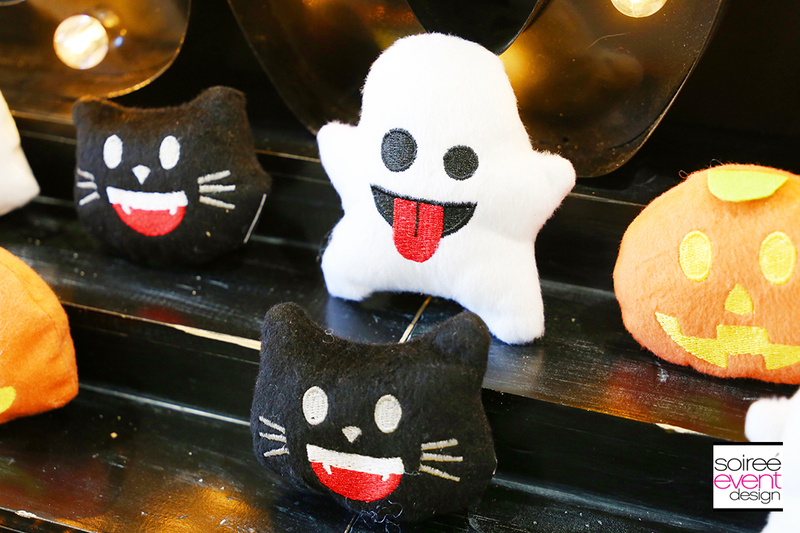 Oriental Trading has lots of Halloween party supplies and Emoji party supplies like these plush Halloween Emojis that I used to decorate the table. These also make faBOOlous party favors! 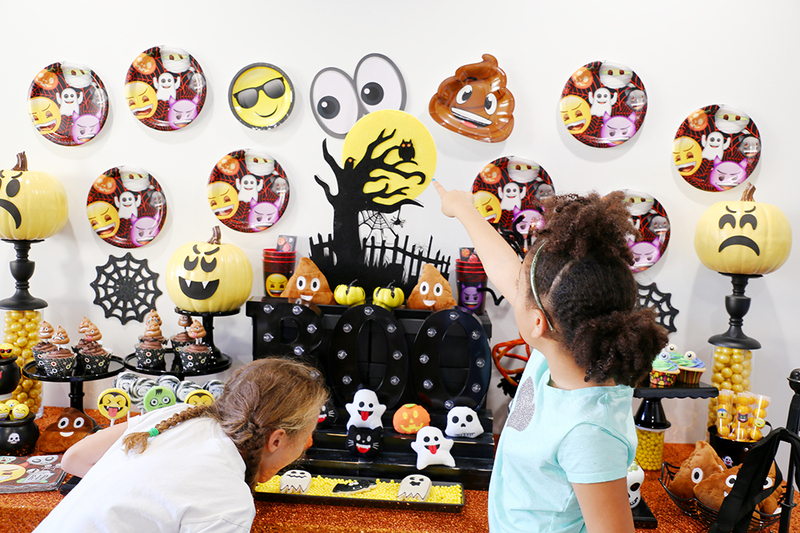 Mixing together Emoji party supplies with Halloween decorations was key in pulling off the look of this party! 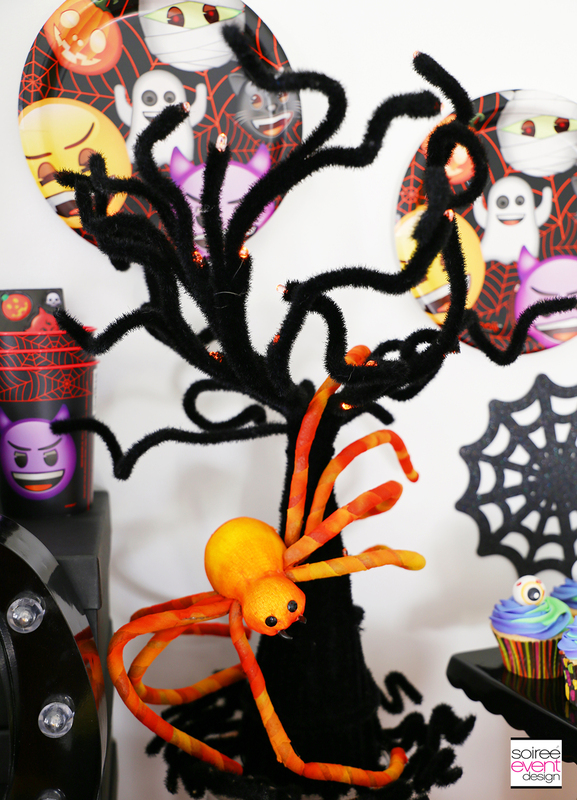 How awesome does this neon spider look perched in that spooky Halloween tree with orange twinkle lights. 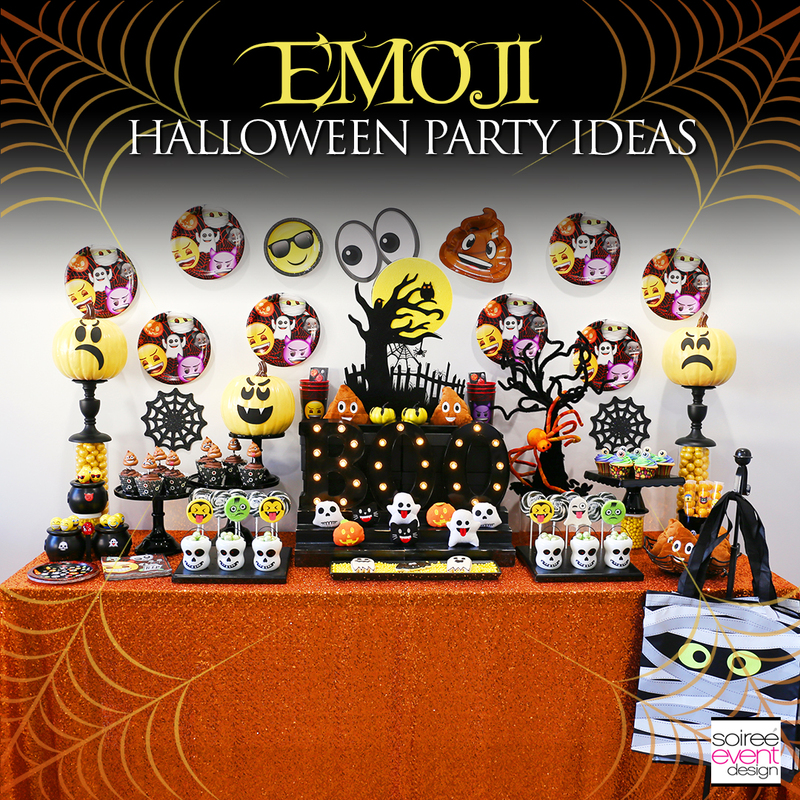 They aren’t emoji themed, but add a spooky touch to the party table! GIRLFRIEND TIP: I use themed stickers to embellish plain decor items that I already own! 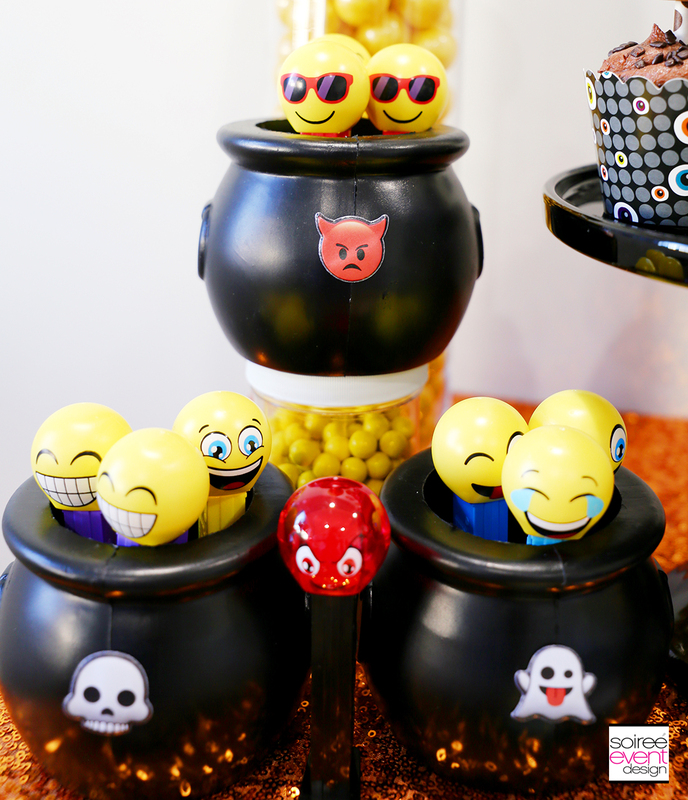 Here I added Halloween Emoji stickers to black cauldrons holding Emoji Pez Candy. When the party is over, remove the sticker and you can continue to reuse your decor items for other parties. EMOJI HALLOWEEN PARTY IDEAS – EMOJI PARTY FAVORS! 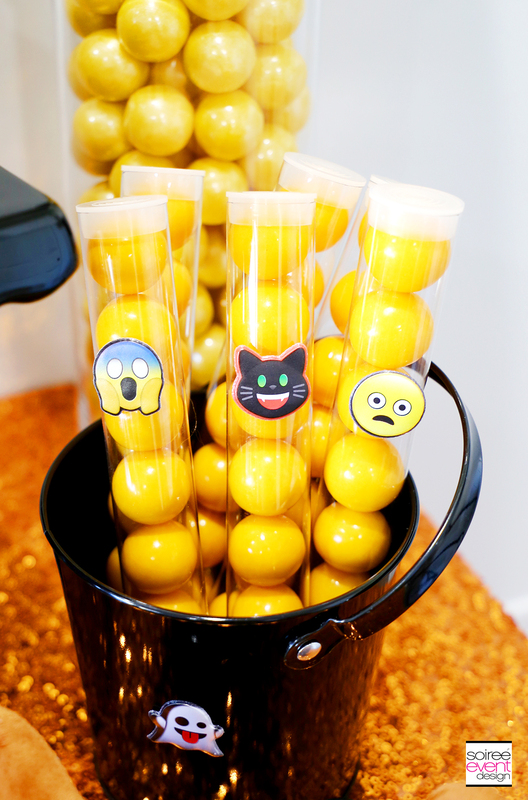 Create themed party favors by adding Halloween Emoji stickers to plain favor tubes filled with yellow gumballs. GIRLFRIEND TIP: Stickers are a great way to create themed party favors yourself using regular candy and containers. How CUTE are these Emoji Halloween Lollipops? They are everywhere right now. 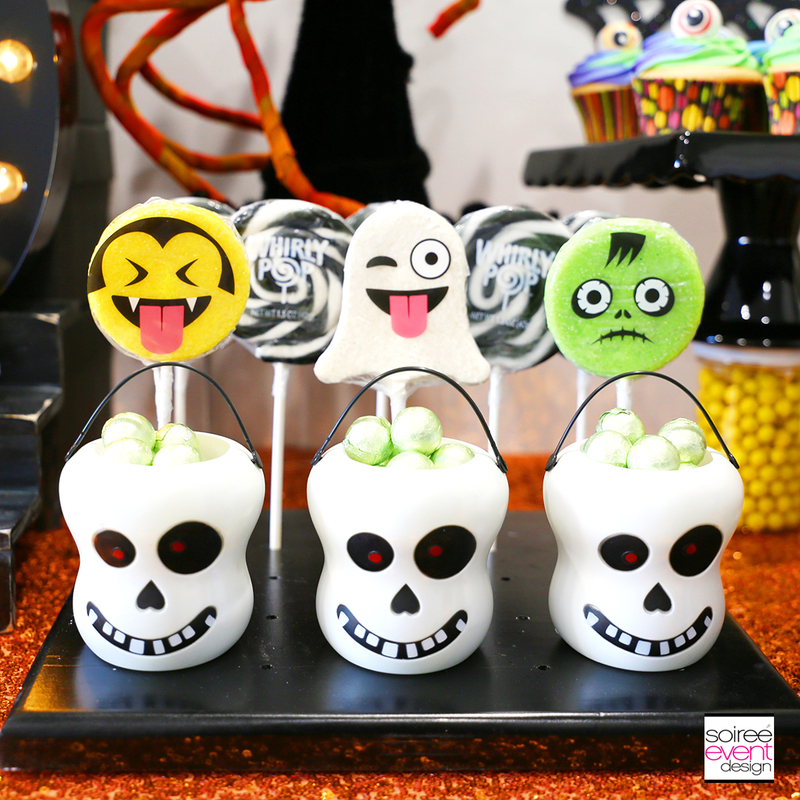 Pick up a few and then fill out your display with black and white swirl lollipops and these super cute skeleton cups filled with foil wrapped chocolate balls. 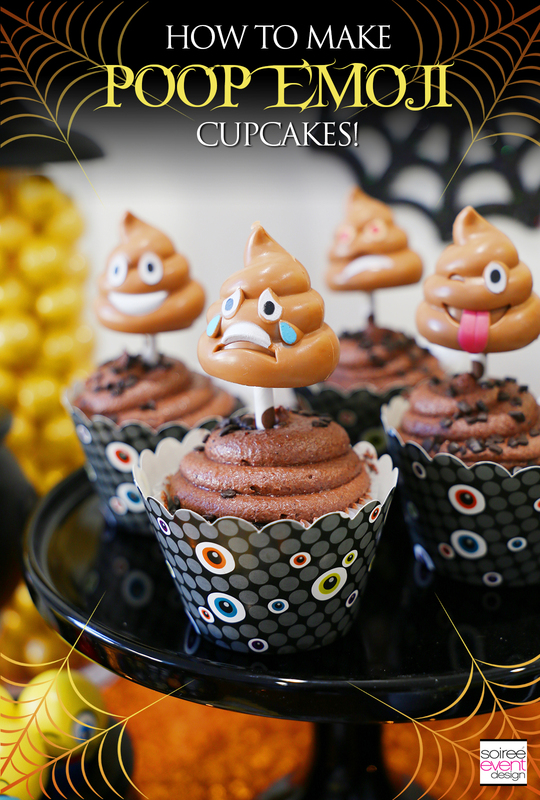 These Poop Emoji Toys from Oriental Trading make fun party favors too! 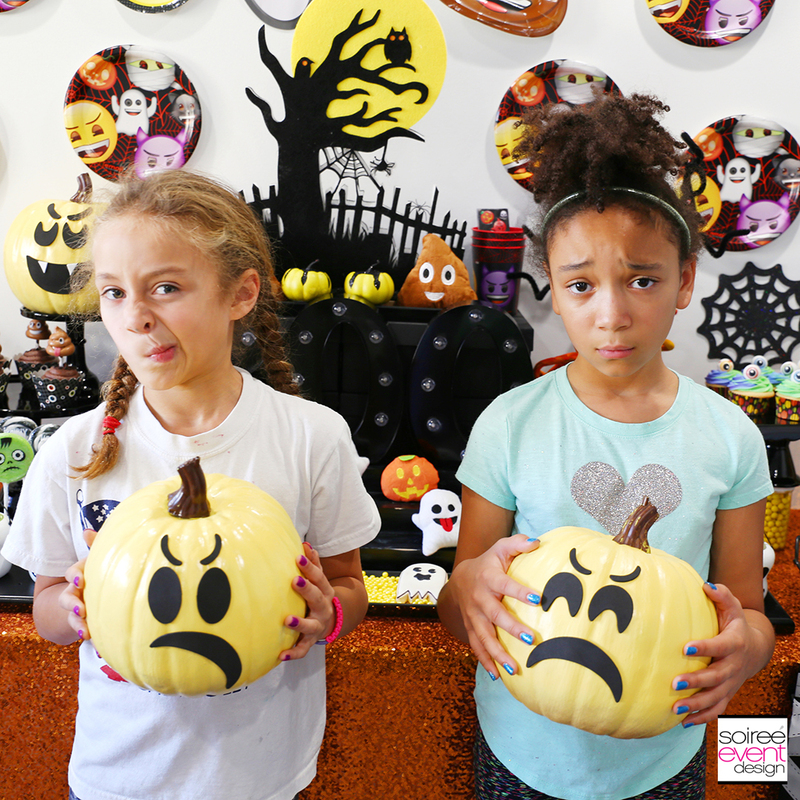 EMOJI HALLOWEEN PARTY IDEAS -DIY EMOJI HALLOWEEN PUMPKINS! Decorate your table with Emoji Halloween Pumpkins that are super easy to make! Be sure to check out my step-by-step tutorial. These would also look awesome on your porch on Halloween night! GIRLFRIEND TIP: To create height on your dessert table, use tall glass cylinder vases to prop up a few of your decor pieces. Here, I placed the Emoji Halloween Pumpkins on top of black candleholders that were propped up with glass cylinder vases. Fill the vases with yellow gumballs to match your table’s color palette. This could also be a fun party activity and the kids can make their own and then pose for pictures making the face of their pumpkin. Riley was sad face emoji! She nailed it! 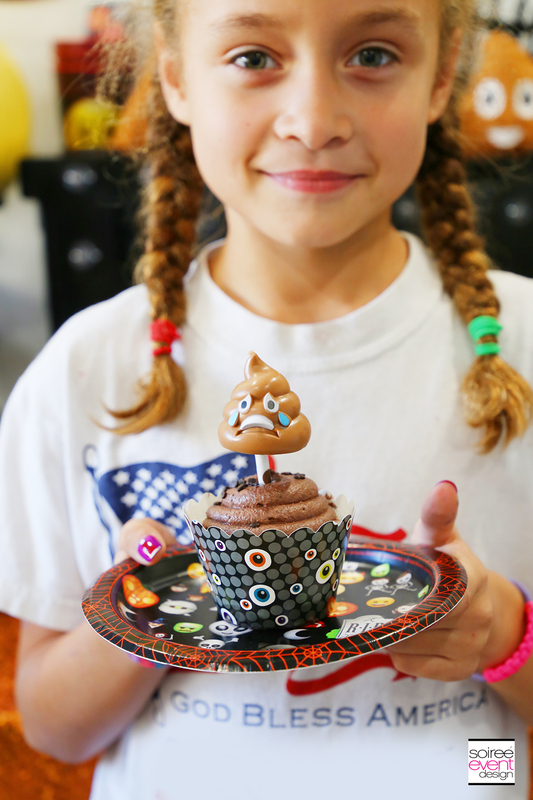 EMOJI HALLOWEEN PARTY IDEAS – POOP EMOJI CUPCAKES! If your kids are like my son, they LOVE the Poop Emoji! Seriously, who would have thought? Since they are so popular, I decided to transform store-bought cupcakes into Poop Emoji Cupcakes with DIY Poop Emoji Cupcake Toppers! These are sure to be a HIT! Be sure to check out my step-by-step tutorial so you can whip these up for your upcoming Emoji party. GIRLFRIEND TIP: Want to be the LIT mom at your kids’ school? Show up to your child’s classroom with these! You are sure to be the coolest mom for sure! 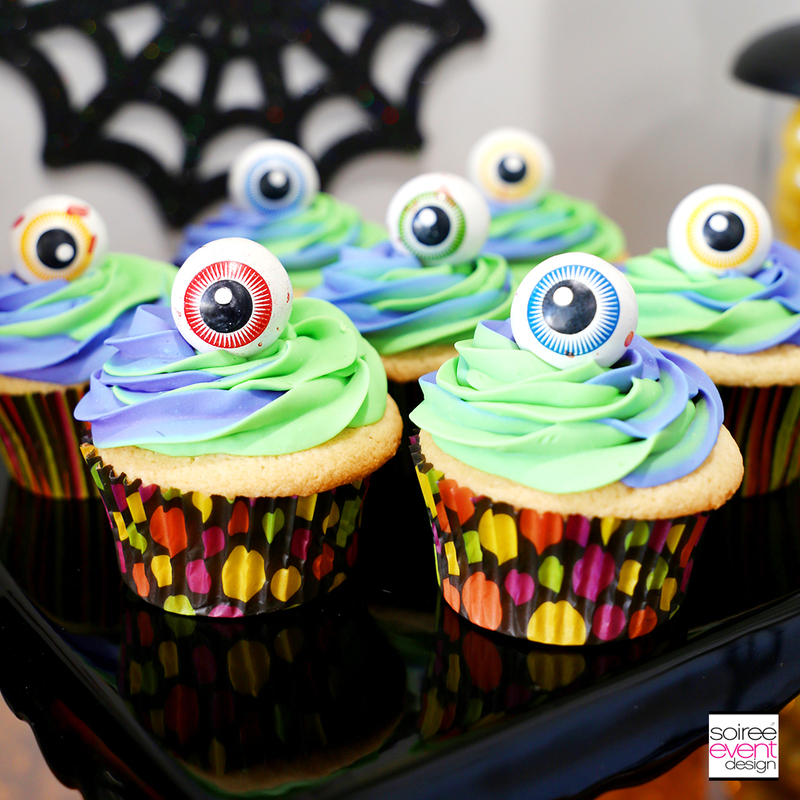 For those party guests who don’t like chocolate cupcakes, offer these Eyeball Swirl vanilla cupcakes. Be sure to check out my recipe for these over on Oriental Trading’s new site – Fun365. 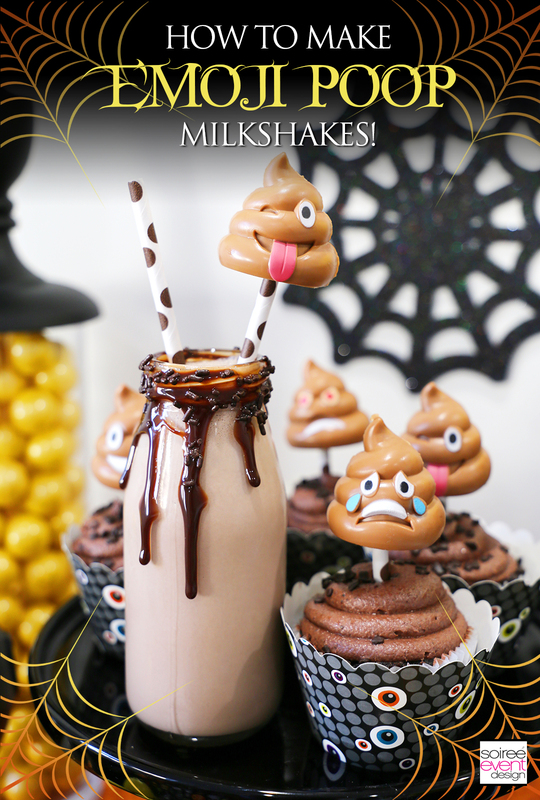 EMOJI HALLOWEEN PARTY IDEAS – POOP EMOJI MILKSHAKES! Serve these Poop Emoji Milkshakes with your desserts. They are easy to make and so delish! Click over to see how to make these Poop Emoji Shakes! EMOJI HALLOWEEN PARTY IDEAS – SERVE EMOJI COOKIES! 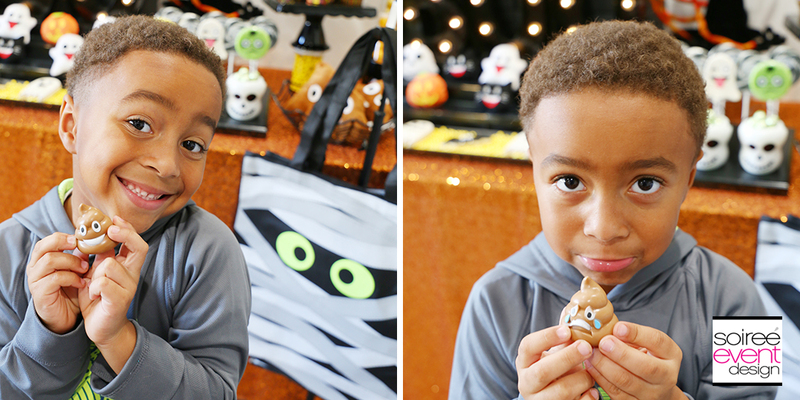 Round out your dessert table with spooky Emoji cookies by Auntie Bea’s Bakery. Display them on a black tray filled with yellow candies so they pop. They look AND taste amazing! 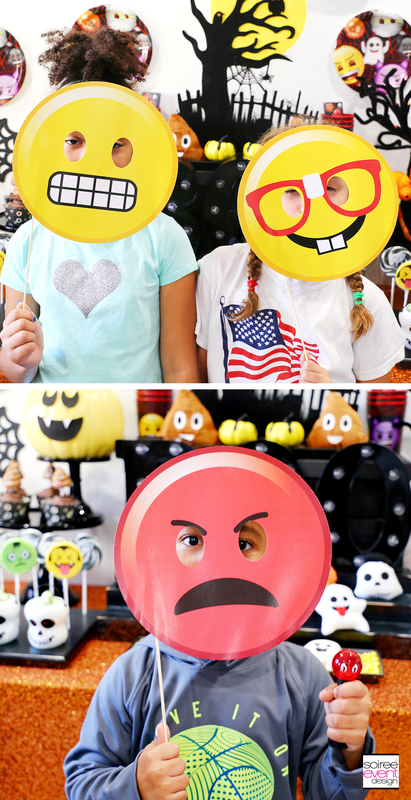 EMOJI HALLOWEEN PARTY IDEAS – EMOJI PHOTO PROP STICKS! 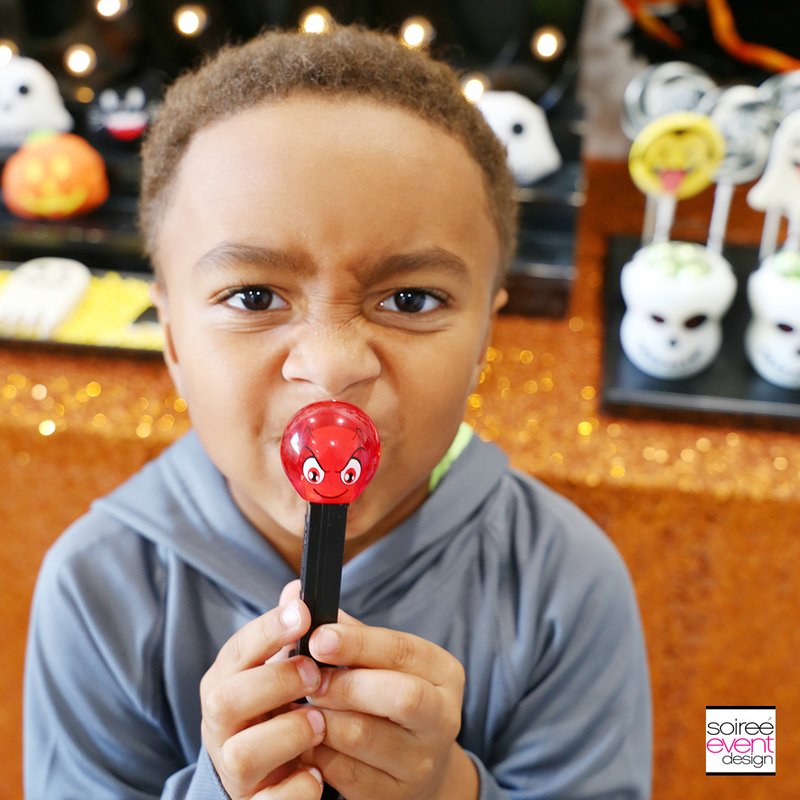 Put out some of these Emoji Photo Prop sticks and let the kids have fun taking pictures. 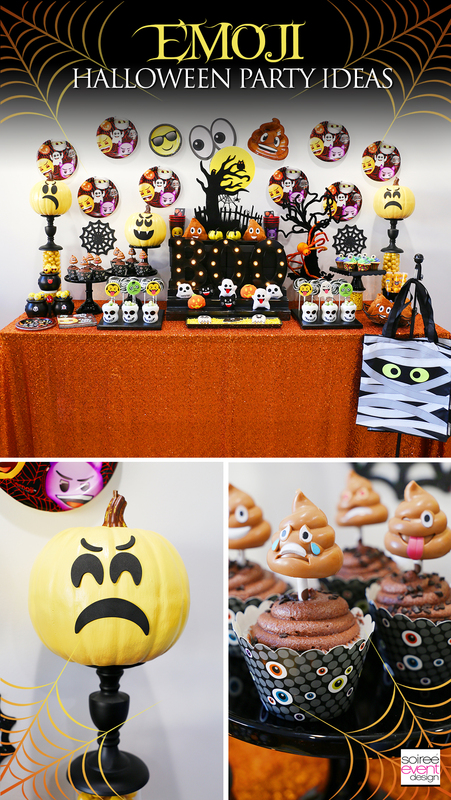 I hope this has given you some Emoji Halloween Party Ideas that you can use to host your own party this year! Omg these emoji theme is hilarious! This could work for other event to! Now I wish it was my daughters birthday so I could organize this theme! That is AMAZING! I love your setup – I want to come party with you this Halloween! You really nailed the fun and festive theme and the emojis are so cute! This is such a great idea! I love the concept! We all use emojis everyday so it’s a great for a party! Amazing job! Love the theme for this party! It’s super adorable. I know my kiddos would love it. Oh my goodness this is such a fun idea for a halloween party. I am loving the plates with all the emoji’s on. My son would love to come to this party. One of his favorite things right now is emoji’s. So an emoji party would be so much fun for him. Love the bags and the pumpkins. What a fun and not scary idea for Halloween fun! Those are the cutes Halloween decorations I have seen so far. Love emojis and the spooky ones are too cute! Specially the poop one! This is so creative and fun! 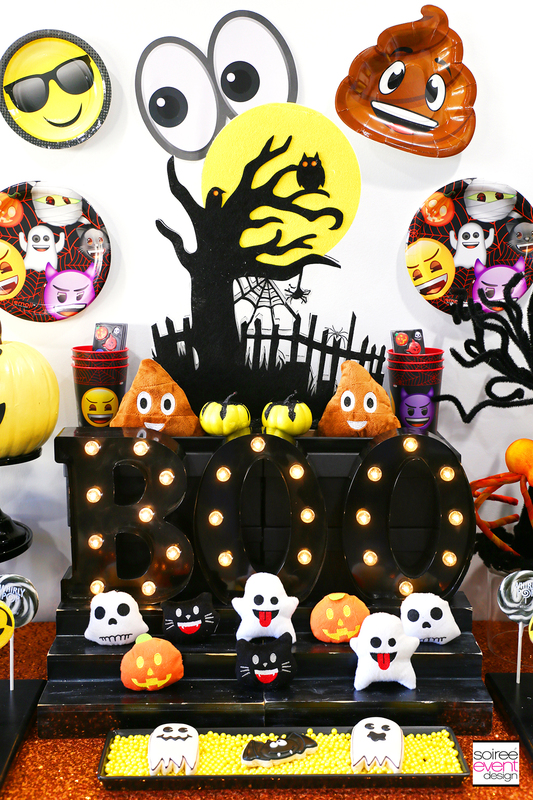 I love the idea of incorporating emojis into the Halloween decor. You always come up with the best ideas. Oh my goodness this is awesome. I love the faces on the kids and that poo cupcake!! Hilarious. This is the ultimate emoji party. Wow, you can really do a lot with emojis..who knew. I love the poop emoji milkshakes. I’m sure that one gets the little ones in stitches. Oh, and the emoji pumpkins are the best! I need to get some Halloween emoji decorations for my Son’s Halloween party. The poop emoji is my favorite. You always have the best party themes. 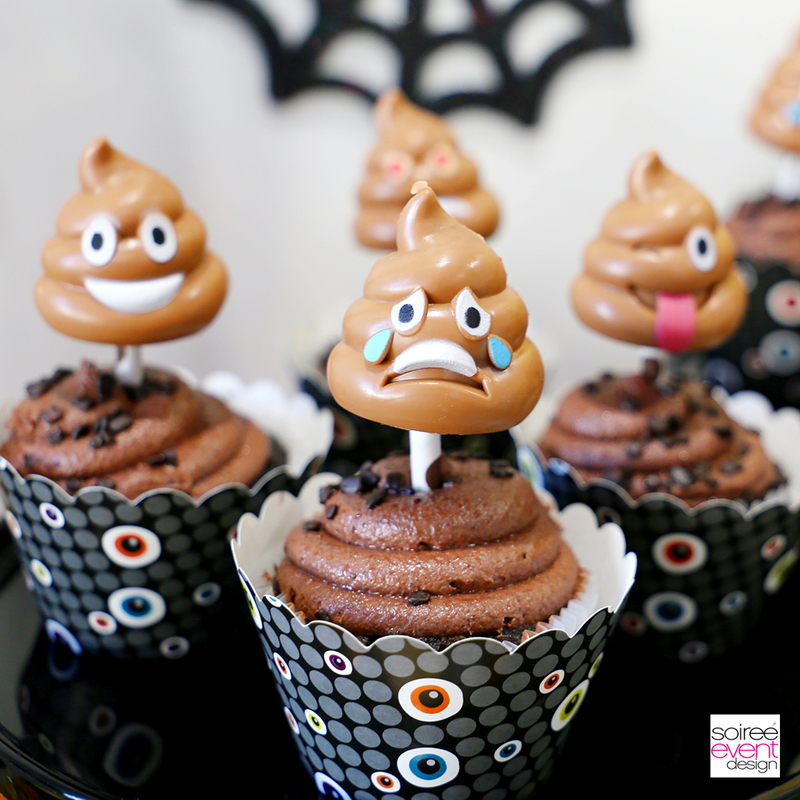 I don’t understand the fascination with the poop emoji either but those cupcakes look yummy. This is just adorable. My son is obsessed with emojis right now so he would love to copy those pumpkins! I know some kids who are obsessed with all things emoji. They would love this party theme for Halloween. oh my! u got me so excited now! at the moment, im crazy about poo and i got a collection! and now i wanna get the spider and the mummy bag! I really like the pumpkins! They’re perfect! It’s such an adorable theme especially for the kids! You always have the cutest parties! I love the emoji Halloween theme. It’s a great idea! This is such a cute theme! We are doing a Halloween party at my daughter’s school- I now all the kids will love the emojis! Oh if I could count the number of Halloween parties we’ve had over the last 40 years…. And that mummy tote bag! I want to use that for my handbag the entire month of October! What a cute party idea! My daughter loves emojis, so this would be something fun to do with her. I never would have thought to do an emoji party though. This is such a cute but spooky party for the Halloween.Poopy toppers look cute,I think it is a god idea for a theme like Halloween.. I love the emoji pumpkins! It’s so cute and spooky at the same time. Oh my word, you’ve absolutely thought of everything! This looks like such a fun party! I had no idea you could get so much emoji stuff. Perfect for Halloween! OMG your party ideas and setups are always on point! My niece would love to attend a party decorated like this. This party is Halloween perfect! I always love your designs and this one is so unique! My kids would love to see the Emojis – especially those cupcakes that look way better than well…you know! Great job! What amazing party ideas !! The table looks fabulous such unique and great ideas for a Halloween Party. Everything you displayed makes me want to have a party !! My daughters birthday just passed but she would have liked this. I will have to remember it for next year. I love the emoji pumpkins too!!! This is a fun theme! Wow! What a great way to use those emojis. He is such a handsome young fella. You put so much effort and detail into this themed party. The decorations are great and those cupcakes and smaller treats are spot on! We never got to dress up and celebrate Halloween in Australia as kids but I so would of loved too. You have so many great ideas here and love all the food decorations too. OMG these are such cute ideas!! You could even do an emoji costume contest! I love it! I seem to love all your party ideas! My 12 year old daughter would go crazy over everything. I never would have thought to do a Halloween party with emojis! So cute. This is awesome! My girls love emojis and would love a party like this. I love your ideas and I will incorporate somr them at my party this year. Wow! I love all of the Halloween party ideas here. Eyeball swirl vanilla cupcakes..perfect!! This is great! I wish I were so creative who you are. My kids would be thrilled. I’ll try to make at least one of this! I remember you saying that Halloween is one of your favorite times of the year. It shows, because each of your parties tops the previous one. Love the theme and your kids make these parties much more fun. This is beyond adorable. I love every idea. I love your design as well. What a cute idea for a Halloween party. All of the emoji stuff is so cute. I especially love that mummy tote bag! This is such a fun concept. I really loved it. Loved this theme. My 7 yr old is a huge emoji fan. She just got a pair of emoji leggings. She would totally love this party. I love your halloween setup so much! Everything looks so well thought out and fun! Wish Halloween was a bigger thing here in Aus! Your sons face holding the poop emoji so hilarious! I love how you did the pumpkins! I can’t carve a pumpkin but a glue gun would totally work and I love the faces you did! An emoji party is such a fun idea. Emojis are so popular these days and with such a great variety you really have endless possibilities. I honestly never thought about using emojis as a theme for a Halloween party! That’s really creative and awesome as well! What a fun party idea. My little one loves emojis and I think she would enjoy some of the ideas that you shared. What a fantastic idea for Halloween. All the kids will love it. I really enjoyed all the photos. 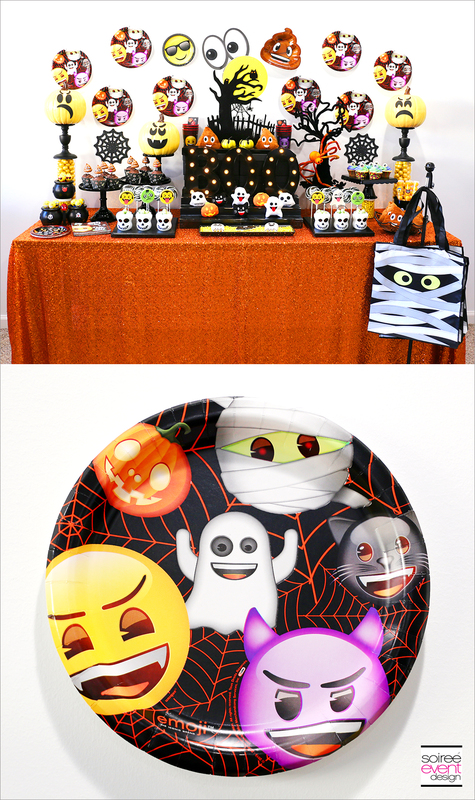 Emoji party ideas are too cute and never thought that it would look perfect for Halloween too! I don’t know many kids not in love with this emoji craze! I love the simplicity of using plates for decor. I can’t wait to surprise my kids with something this fun! This is SO adorable!! I absolutely love it! My son’s aunt is having a gender reveal / Halloween party this weekend, I’m going to have to show her this. The kids would love it! Thanks for sharing! Great party ideas! This article made my life easier! Thanks for this. Such an inspiration for our upcoming party. Excited to try these all. This is so adorable! I love how creative you are. 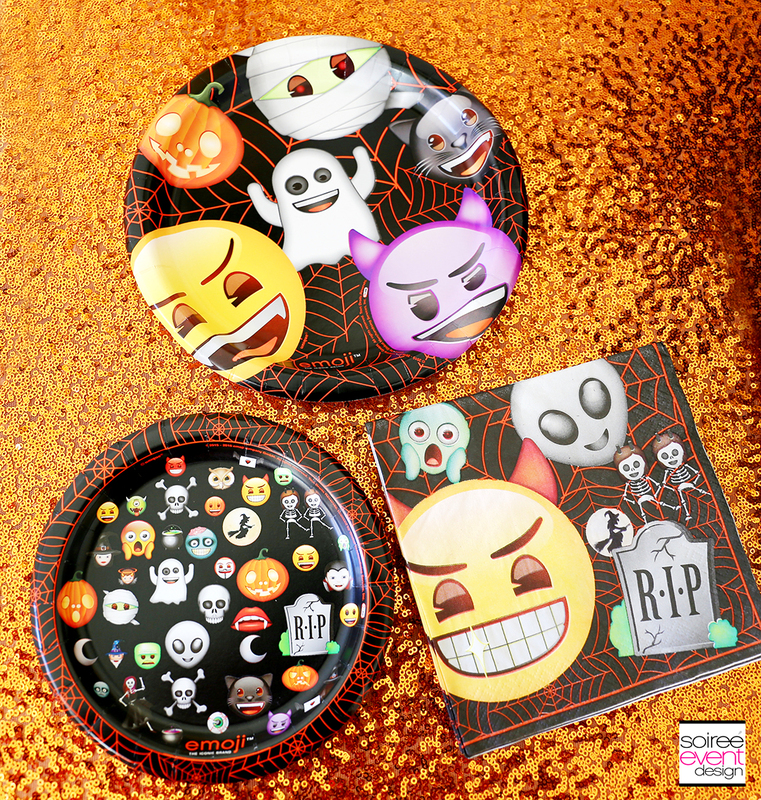 Emoji Halloween sounds like a super cute fun theme party ideas! Those cupcakes look divine! haha so much fun. You did really weel. Your kids friends are gonna love it. 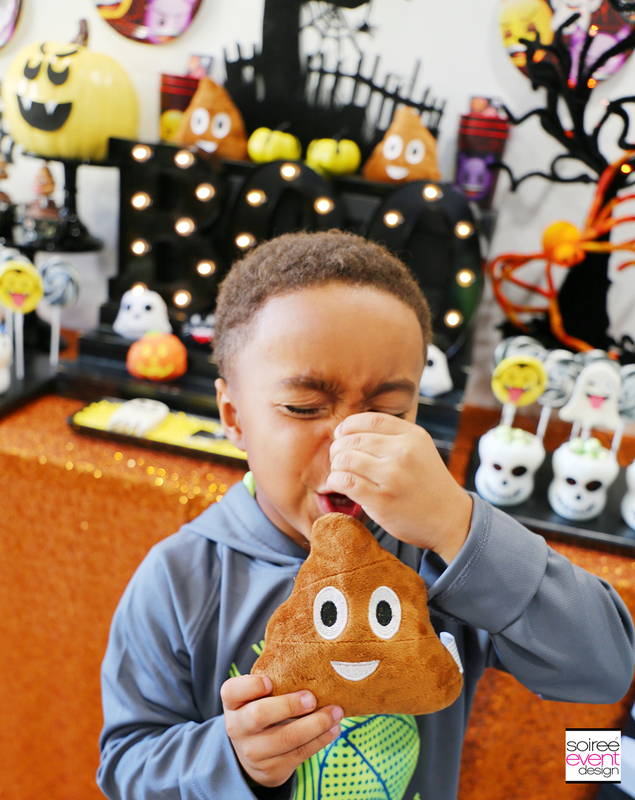 And those party favors ideas like these awesome plush Poop Emojis are the best, yep, you are right Kids love Poop Emojis! ha!